The San Diego Craft Beer Getaway Trip is open to anyone who is at least eighteen (18) years of age and has reached the age of majority in their jurisdiction of residence at the time of opt-in (19 in Alabama and Nebraska; 21 in Mississippi) and lives within the continental United States and has a valid email address. The San Diego Craft Beer Getaway Trip ends on July 11 at 3:59am. You may enter the Sweepstakes by visiting dojomojo.ninja/landing/campaign/1392 and completing the entry form. There is a limit of one (1) entry per person/email address. One (1) grand prize will be awarded and one (1) winner will be chosen. Description of Prizes: Grand Prize (total value of $2500). 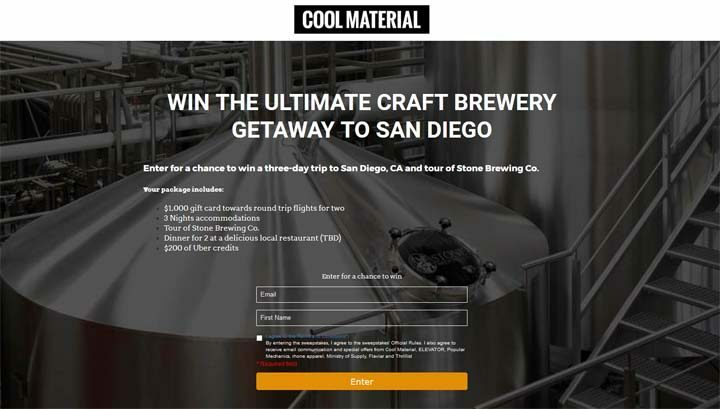 $1,000 gift card towards round trip flights for two 3 Nights accommodations Tour of Stone Brewing Co. $100 Gift Card for Dinner for 2 at a delicious local restaurant (TBD) $200 of Uber credits.